Sweet Assassin: I'm lovin' it! I'm really proud of my numbers today. Of course, I really really really wanted to go all 20 rounds, but by round 14 I had run out of time in my minute. 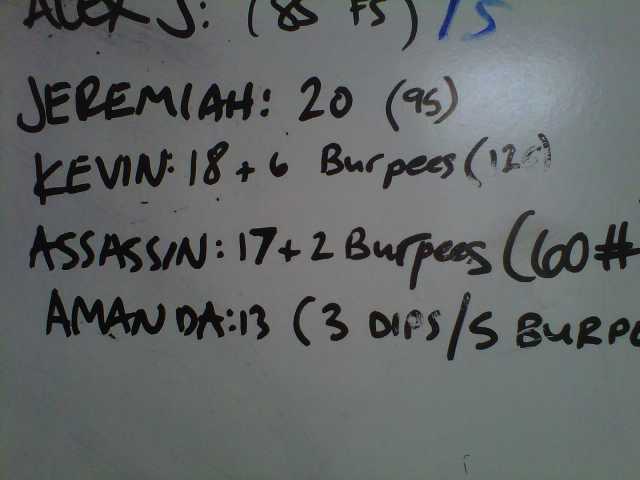 My burpees were several seconds apart and were like slow motion. My arms were burning pushing up in the burpees at that point. Not sure when but, I had to go outside cause I felt like puking; burpees do that to me. David was kind enough to record video me doing the squat clean for critique. 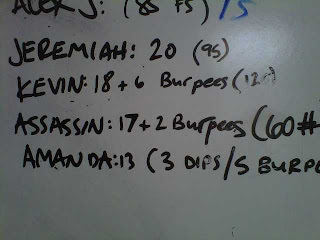 This one was round 7, of which I was about to hit some wall, so I was pretty tired. It's in slow mo, but the audio isn't, which makes it funny. Things I need to work on: I'm jumping a little to early. Dave says I'm shrugging the bar too high, which is a waste of energy, yet i'm not getting below the bar fast enough. Remedy would be to not jump the bar so high, and just work on my speed to get under the bar and make sure I catch the bar on my shoulders, not my hands- a sure sign that the bar is traveling too far in front of me. Video 2 is the same Squat Clean, but it is my last one (#18) in the 20 mins. At this point, I am wrecked and tired. The video is 1:30+ seconds long, but my clean doesn't happen until 1:14. So I apologize for the long set up--- I WAS TIRED!! Of course, all the little errors that were in the first video are more pronounced due to me being tired. I noticed that I'm catching the bar way out in front of me, making me land on my toes. My elbows are pointing down and NOT parallel to the floor. I believe Diso is going to start taking video of us on the regular, which is GREAT because then we can see ourselves in action and see where we need work on certain movements, so I'm lovin' it!